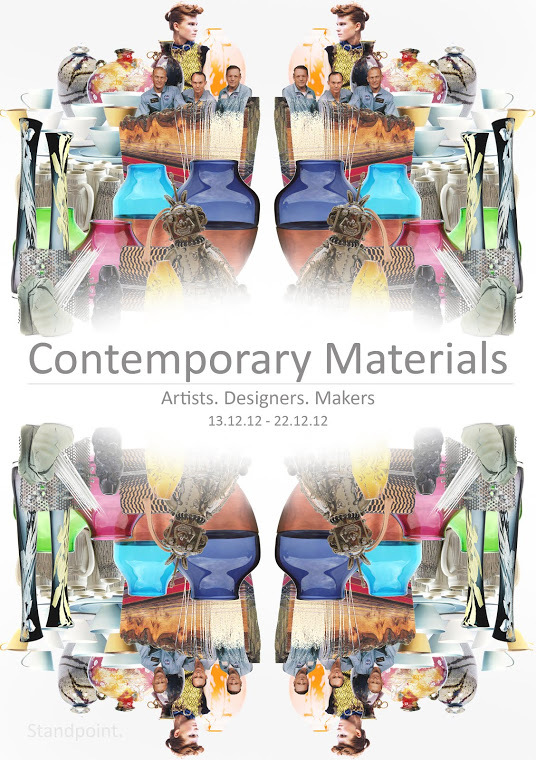 Exhibition: Contemporary Materials. Artists. Designers. Makers. Teresa Georgallis is a textile designer specialising in woven fabric for fashion and interiors. 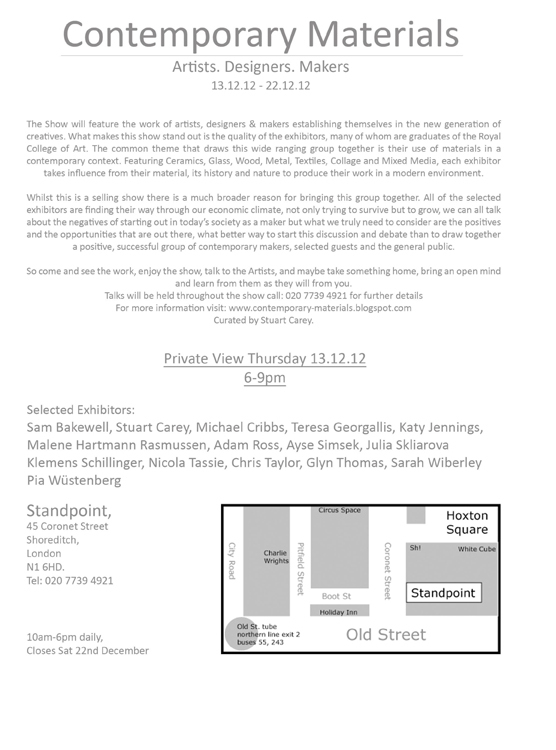 In June 2012 she was awarded the Clothworkers’ Foundation Award / Cockpit Arts Award and she is now based at Cockpit Arts Deptford. After graduating from the Royal College of Art she has been working on a series of hand woven interior textiles, fashion accessories and stationary prints. 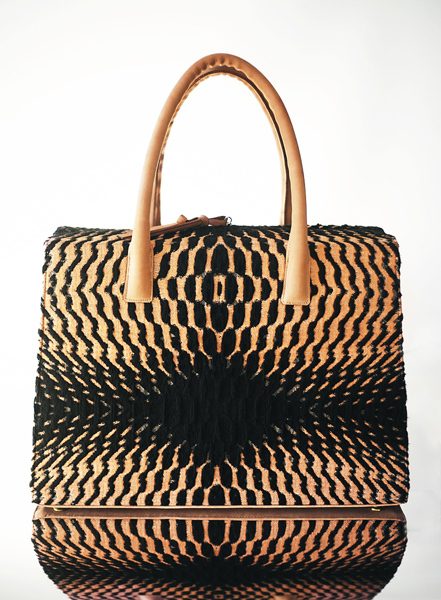 She has developed a collection of luxury bags using her woven textiles combined with leather. All of the bags are one-off pieces designed and made by Teresa in collaboration with a leather craftsman. Julia has created a collection of high-end womenswear jacquard and hand-woven fabrics exploring dimension through engineering and material manipulation, which was achieved via an experimental approach examining structures and yarn combinations and proportions. Inspired by the juxtaposition between geometric interlocking structures and organic textures and surface reliefs, the collection references techniques of traditional rug-weaving and knitting. The structures and textures of the fabrics are exaggerated through the play of contrasting properties of leather, linen, stretch nylon and crêpe yarns to achieve 3D fabrics.Striving for a bold look within her collection she aimed to be playful in application application of scale by magnifying the engineered 3-dimensional details and combining them with brightly coloured geometric 2-dimensional, almost print-like, patterns. Having recently graduated from the Royal College of Art with an MA in Textiles Ayse creates handwoven one-off textile pieces for interior spaces; either as wall-hangings or for windows, and complex multi-directional yarn windings. 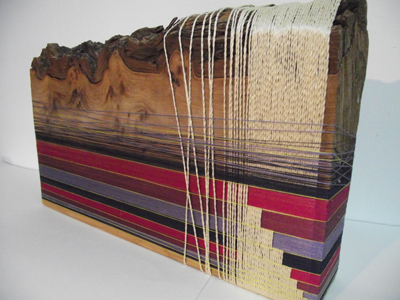 She weaves and wraps commission-pieces from her studio at Parndon Mill, Harlow, Essex. Ayse’s weaving explores ways of combining high contrasts together within a single piece of cloth. 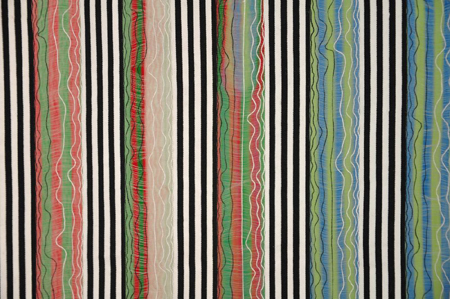 Using mostly linen and silk, she experiments with weaving techniques – both traditional and more unconventional, such as distortion and manipulation together with gradating colours and texture and varying opacities; that can allow these contrasts to work together in either subtle or more surprising ways. The yarn windings are both a way to express ideas for woven cloth, and to create intricate layered patterns that would not be possible to recreate on the loom, as textile art pieces. This entry was posted on Monday, December 10th, 2012 at 7:02 am	and is filed under Events, Exhibitions, General, New weave developments, News. You can follow any comments to this entry through the RSS 2.0 feed. You can leave a comment, or trackback.